This past weekend, I got the opportunity to watch a fascinating documentary on Hall of Fame QB Joe Namath. It shows on HBO and prominently includes interviews with Namath, teammates, journalists, and Beaver Falls, PA residents. One of the things that most impacted me was the incident that occurred between Namath and ESPN sideline reporter Suzy Kolber during a 2003 prime time game between the Jets and Miami Dolphins. Namath was honored along with his teammates from the 1969 Super Bowl team. Namath admitted that he had been drinking heavily all day. By the time the 4th quarter rolled around, he was completely intoxicated. Kolber was charged with interviewing Broadway Joe. In the beginning, it was apparent that Namath was having some issues talking, but they had no idea what was about to happen in front of the entire prime time audience. 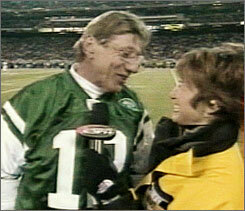 Namath eschewed Kolber’s question about Chad Pennington and several times told her he wanted to kiss her. ESPN scrambled to get out of it, but the damage was done. Namath admits he was humiliated. In fact, that set the stage for him to reform his life to where it is today. But, I digress. The thing that resonated with me was the response by Suzy Kolber. She was interviewed for this documentary and clearly recounted the event, with assistance from the footage. She recounted how Namath called her the next day to apologize. She said it took him 5 minutes to apologize and she accepted. She then spent 45 more minutes on the phone with him talking football and life. Here’s what she said that so intrigued me. She said, “What I saw was a really good guy who was in trouble.” She felt bad for him, didn’t judge him, and saw him not as some drunk who couldn’t control himself, but as a regular guy who needed help. In the world of sports, we are very quick to pass judgement. We often look for and hope that successful people fail (see Tim Tebow). We automatically jump to the conclusion that someone is damaged. I loved that Suzy Kolber looked deeper. She really exuded a perspective that thinks of the human being first. Often, journalists are the most cynical. Kolber showed humanity. I’m as guilty as most of us. It’s easy to throw guys under the bus; make fun of them; and not worry about consequences to their lives. Suzy Kolber gave me perspective and one that I hope I can keep the next time my QB throws an interception or one of my sports “heroes” falls. Last week in the 2A football semi-finals, a star running back from Tumwater was assessed a 15-yard unsportsmanlike penalty after scoring a touchdown. So what did he do – spike the ball in an opponent’s face; taunt the other players; do a celebratory dance that would win him a spot on Dancing with the Stars; or maybe he took a page out of Chad Ochocinco’s book and played imaginary golf? Nope. He just humbly knelt, raised his hand to heaven, and quickly prayed. It took about 2 seconds. Too much for the referee who interpreted the unsportsmanlike rule of calling attention to himself. Are you kidding me? I’m all for the WIAA enforcing rules that prevent kids demeaning and taunting opponents. What they view in professional football is unacceptable at this level. But really. If this had been some expanded prayer service held in the end zone that delayed the game or made people even bristle, then okay. But watch the video. It lasts maybe two seconds,. If you blinked or were high-fiving your buddy, you would have missed it. This was a judgment call by the referee and it was a poor one. In an age of raising kids where social media, technology, texting, sexting, drugs, alcohol, and other crazy things can lead kids down bad paths, it’s sad in my mind to make an example of a kid who prays after scoring a touchdown. By the way, kudos to the kid and his coach. Neither condemned the referee publicly. The player said he would stop doing it so to not take a chance and penalize his team. These are stand up guys. I think we could all use some more praying going on! In one last bit of irony, I thought it humorous that Tumwater went on the play Archbishop Murphy, a Catholic school, in the finals. My wife isn’t a big football fan. Let’s just say she is lukewarm at best when it comes to watching games on TV. My two daughters have been raised well by me. They love football. 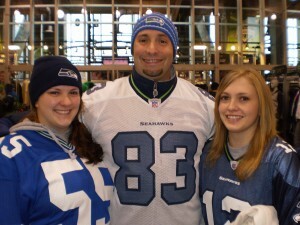 They both watched games with me, played fantasy football, and went to games. They are die-hard Husky and Seahawks fans. The last three years I’ve had one daughter at home while her sister was away at college. This will be the first year I’m on my own. As much as I like many aspects of being an “empty-nester,” this isn’t one of them. Watching football by yourself isn’t any fun. Now, don’t get me wrong, I love watching football more than any other sporting event, and will watch solo if I have to. It’s just not as much fun. I’ve always enjoyed the chance to watch America’s Game with my girls. They are able to talk the game with anyone…like I said, I raised them well. This year of both of them being gone creates a huge void. My wife has no interest in filling that particular void. Although this distance creates challenges, I’m sure we will overcome. Like all great football fans, the games go on and the camaraderie that flow from it find a way to continue. I’m going to the Seahawks-49’ers game Sunday with my brother-in-law, so I will have a live view of this re-made team. It’s a terrific way to start the season, however I think I would still trade it in if I could somehow transport my kids here on Sunday to watch with me. I guess we will have to leave it up to technology like texting and Skype to get our football fix! Tough loss last night for Auburn in the Little League World Series. I was watching the game on television in a Pittsburgh sports bar before catching my plane. I was pumped when the boys from Washington took a 5-3 lead in the 5th inning. I just red the results of the Texas comeback win this morning on ESPN. Great year and effort for the kids from the Northwest. It’s exciting to see a local team to a national stage. Gets me excited for Kitsap County’s own Babe Ruth 13-year old World Series in 2012. Some of the Little Leaguers you will see on ESPN next year may very well be playing in our tournament. Planning is now going full steam ahead for the 2012 Babe Ruth World Series. I am excited to be on the board as Director of Public Relations and we can use all the help we can get. Follow the progress on our Facebook page. 4 – I think we are going to catch a Pirates game on Tuesday. They are playing the Cardinals and Albert Pujols. I love going to other stadiums in any sport, and getting the chance to watch a potential Hall-of-Famer. The Pittsburgh stadiums are gorgeous from the outside and I’m looking forward to the game. 5 – Missed the Seahawks on Saturday but I heard they played well. After reading Coach Carroll’s book, I must admit I am excited for the season and to watch them compete. 7 – Lou Piniella officially retired this week to take care of his ailing mother. Lou is first-class all the way. Thanks for everything you did for the Mariners and baseball, Lou. You will be missed! More this week from Pittsburgh as I do my Charles Kuralt impersonation! I’ve always liked Lance Armstrong. I read his first book. 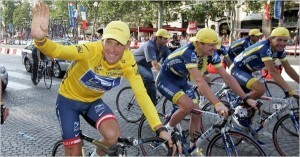 I marveled at his ability to beat cancer and become a Tour de France champion. I thought he did it the right way. Yesterday’s New York Times article has noted many more clear signals that Armstrong “doped up” during his years with the United States Postal team (ironic, huh). No one wanted to believe Floyd Landis who admitted to doping himself. Does this sound familiar to you? Jose Canseco comes out and admits to using steroids. He calls out some of the biggest names in the game – Mark McGwire, Sammy Sosa, and Rafael Palmeiro to name a few. They all deny it, even in front of the United States Congress. Oops. Turns out they all used. Jose was right. Each one has had to plead their own mea culpa. Since then, Alex Rodriguez has come clean. Roger Clemens won’t admit, but we all know he did and his reputation is tarnished forever. I don’t have rock solid proof that Armstrong doped. But just as I really knew McGwire, Sosa, Clemens, etc. all cheated, I know he did, too. What do you think? Do you believe Lance? 1 – Berhard Langer deserved the win at Sahalee over the weekend at the US Senior Open. He played brilliantly. You can’t recover from a triple-bogey on a Par 5 in a major champonship. Fred Couples gave it a valiant effort, but he was done at that point. 2 – The Mariners stink offensively. I know that this is not news to you, but being stuck in my seat after surgery, I forced myself to watch them. This is the worst offense I have ever seen. Heads need to roll. Not sure who, but they do. 3 – Felix Hernandez impressed me. He wasn’t sharp on Saturday giving up 3 quick runs in the 1st inning. After that, nothing. That’s the mark of an excellent pitcher. To gut through a bad start and then keep your tram in the game. Kudos to him and to pitching coach Rick Adair. I’m seeing a lot of that from our pitchers. 4 – Football is back! The Pete Carroll era is upon us and I must admit I am very intrigued. After a 5-11 season, this would have been the only thing intriguing me about the Hawks. From that standpoint alone, it was a brilliant move.